So, you know, how stereotypes are stereotypes for a reason? 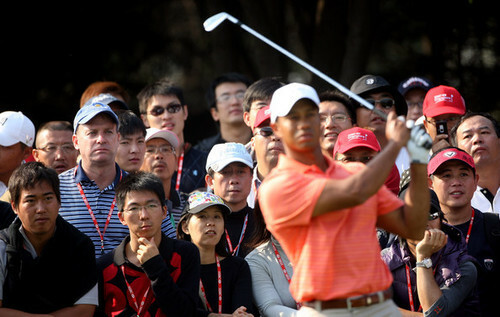 The masses along with their cameras came out in full force to watch the main act — Tiger Woods, of course — at the HSBC Champions in Shanghai. The Chinese feel great honor to play host, but apparently many aren’t familiar with golf course etiquette, snapping a gagillion photos and inadvertently interfering with Tiger’s zen-master-like focus. The guy in the grandstand basically did almost a photo sequence [during my downswing]. I flinched on it and I hit it straight to the right. I wouldn’t say that. I would say that there’s no history yet. The populous has not played golf long enough to understand yet, and that takes time. There’s a lot of countries we’ve played in that’s the same way, but over time as they get more experience and more people playing the game […], then it doesn’t happen as much. But the bigger concerns here are why cameras are permitted and/or why it’s not being regulated better. Watching the second round coverage, it doesn’t sound like the clicking has toned down much. Now just curiously waiting for Stevie Williams to go into total batshit bodyguard-mode.